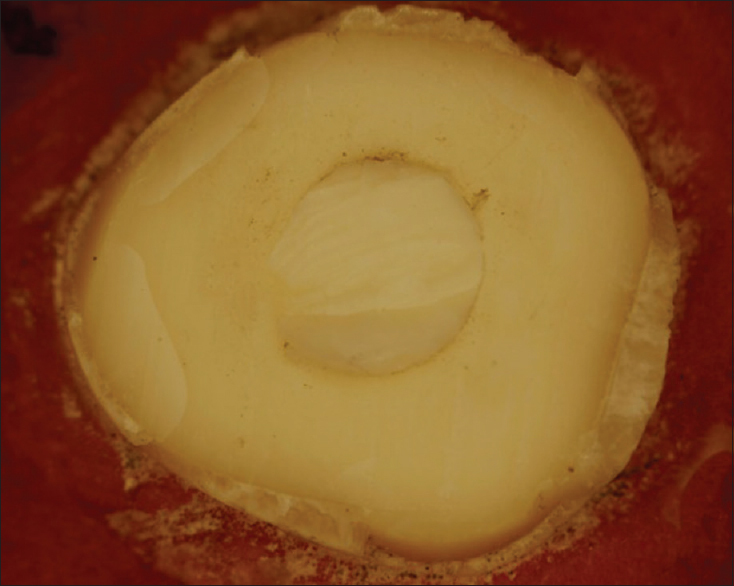 Aim: Use of silicone fit-checking material during cementation of fixed restoration has shown to leave residual silicone film after peeling off of fit checker (FC). This residual film reduced bond strength of cement to the inner surface of restoration. Silicone residue effect on tooth surface needs to be studied. The aim of this study was to evaluate the effect of residual silicone film on shear bond strength (SBS) of glass ionomer cement (GIC) to dentin surface and the efficacy of different surface treatments (STs) on dentin in the removal of silicone residue. Materials and Methods: Fifty freshly extracted human molars were individually mounted on acrylic blocks and occlusal surfaces were ground flat until dentine surface was exposed. Specimens were divided into five groups as follows: Group I: without application of FC (n = 10) as control group; Group II: without any ST after peeling off FC (n = 10); Group III: ST using wet pumice after peeling off FC (n = 10); Group IV: ST with 37% phosphoric acid after peeling off FC (n = 10); and Group V: ST with 10% polyacrylic acid after peeling off FC (n = 10). GIC was placed on the dentinal surface using polyvinyl mold and subjected to SBS test using universal testing machine. The debonded specimens were observed under stereomicroscope for the mode of failure. 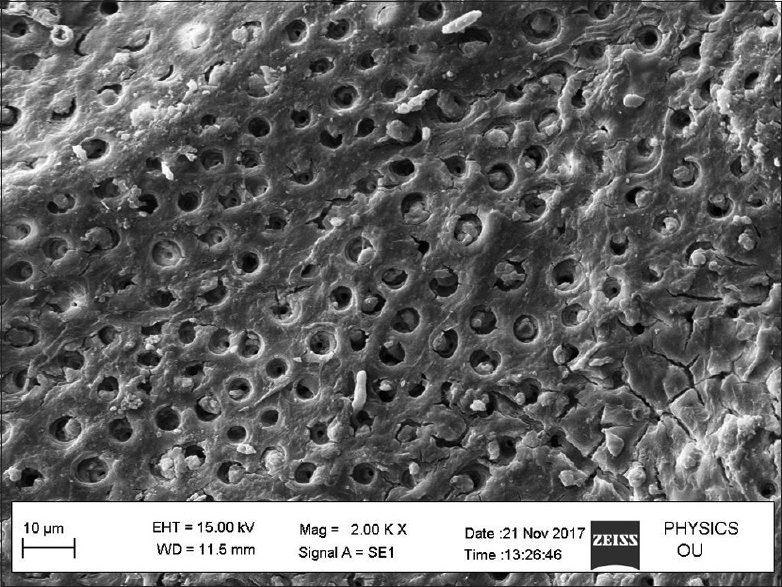 Selected debonded dentinal surfaces from each group were examined under scanning electron microscope. One-way analysis of variance and Tukey's test. Results: Group II (1.083 MPa) showed significantly lower SBS. Among the STs, Group III (2.047 MPa) was comparable to the control group whereas Group IV (1.376 MPa) and Group V (1.63 MPa) were significantly lower. There was no significant association between failures and groups at P = 0.257. Conclusion: The residue of silicone was demonstrable on dentin surface after peeling off FC and caused a significant reduction in SBS between GIC and dentin. ST with wet pumice is found to be beneficial in removing silicone residue and improving SBS, followed by phosphoric acid and polyacrylic acid. A total of 50 (n = 50) freshly extracted molar teeth were collected and stored in 10% neutral-buffered formalin. 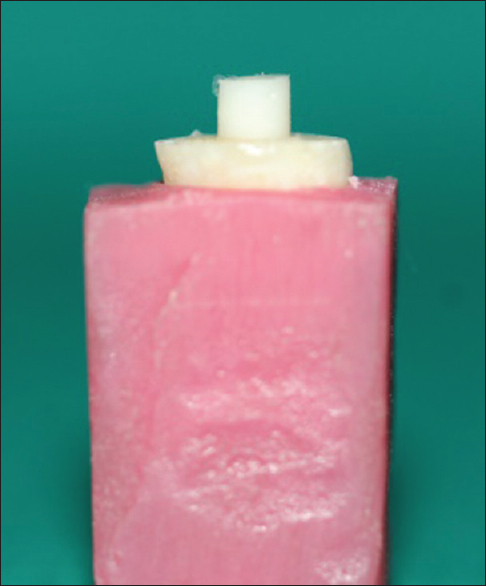 The radicular portion of prepared tooth was embedded into the autopolymerizing acrylic resin block (25*15*15) leaving the coronal portion open. The occlusal surface of the tooth was ground flat till the dentin was exposed using a model trimmer with diamond disk, followed by manual polishing of the dentinal surface using wet 600 grit silicon carbide paper and cleaned under running water. All the specimens [Figure 1] were prepared in the same manner. Specimens were divided into five groups with 10 specimens in each group. A prefabricated polyvinyl mold of 3.5-mm diameter and 3-mm height was positioned on the flattened dentinal surface [Figure 2]. GIC Type I (GC Corporation, Tokyo, Japan) was mixed following the manufacturer's instructions (3:1). The mixed cement was placed in the mold and held under hand pressure. The polyvinyl mold was removed 10 min after setting of the cement. The samples [Figure 3] were prepared groupwise and subjected to shear bond strength (SBS) test using universal testing machine (Instron 8801, Europe) until fracture. 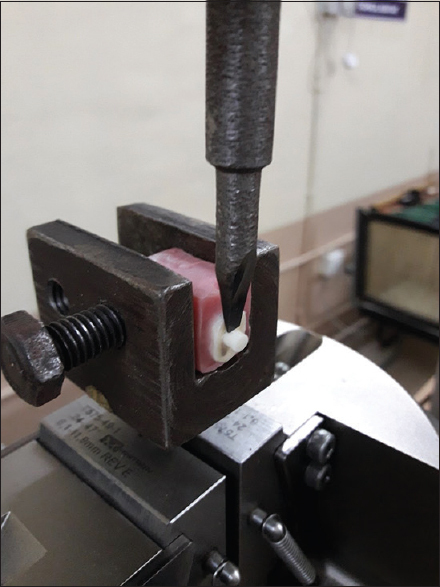 The specimen was placed in the lower assembly of the machine and force was applied onto the cement parallel to the occlusal surface of tooth at a crosshead speed of 0.5 mm/min [Figure 4]. The maximum force needed to debond the sample was recorded in newtons (N). Descriptive statistics of the SBS (MPa) of the different groups is summarized in [Table 1] and [Table 2]. ANOVA showed statistical significant difference among the various groups (P < 0.05). Statistically significant reduction in SBS was found from Group I (2.599MPa) to II (1.083 MPa), IV (1.376 MPa), and V (1.63 MPa). No statistical significance was found between Groups I and III (2.047 MPa). Statistically significant reduction in SBS was found from Group III to II and IV. No statistical significance was found between Group II and IV; II and V; V and III; and V and IV. Three types of failures were recorded – cohesive failure [Figure 5], adhesive failure [Figure 6], and mixed failure. 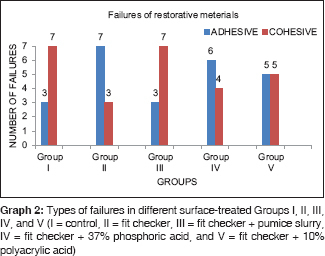 Groups I and III showed predominantly cohesive failures, Groups II and IV showed adhesive failures, and Group V showed mixed failures [Table 3]. The Chi-square statistic (Pearson's χ2) revealed that there was no significant association between the failures and the groups (P = 0.257). 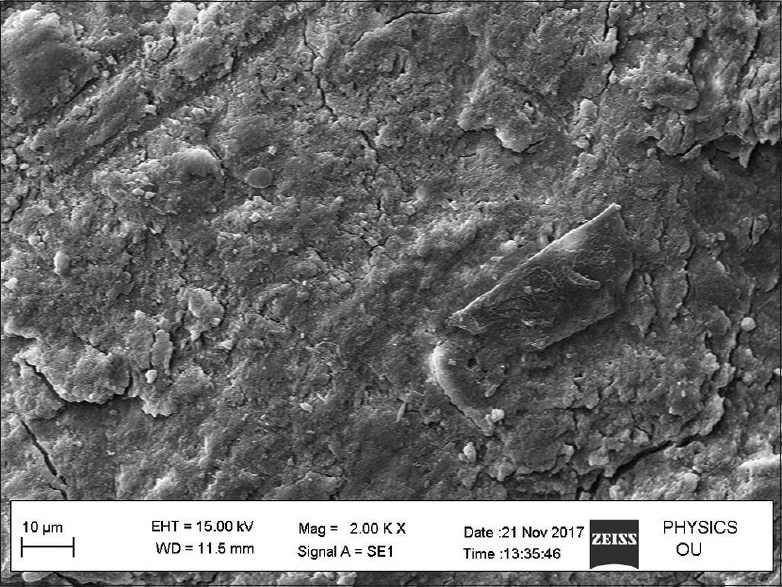 [Figure 7], [Figure 8], [Figure 9], [Figure 10], [Figure 11] show representative scanning electron microscope (SEM) images of debonded interfaces after tensile bond testing. The mean SBS value obtained for Group I (control group) was 2.599 MPa [Graph 1] which was within the typical range shown in the previous studies. Peeling off FC resulted in 58% loss of mean SBS in Group II (1.083MPa) compared to Group I. 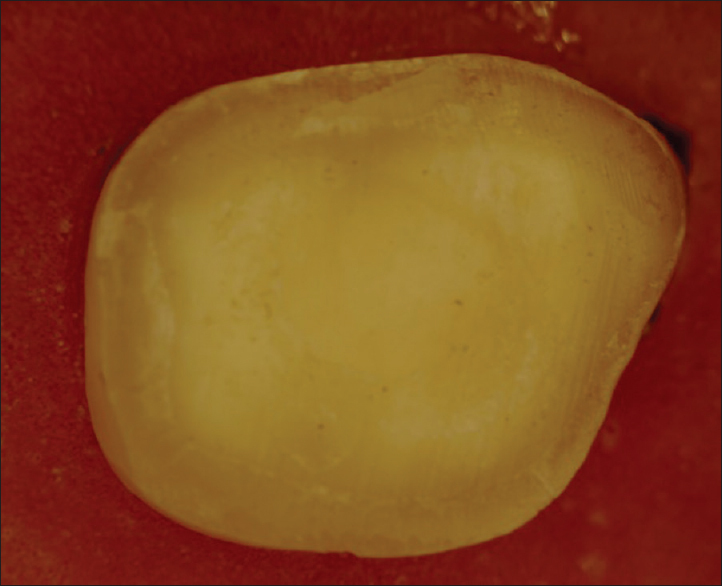 Similar kind of results were shown for the retention of the luting cement to the cast metal surface as well as ceramic restoration., This loss of retention is suggestive of failure of cement to form a bond with hydroxyapatite of dentin due to the presence of silicone residue. Stereomicroscopic analysis of the debonded dentin specimens revealed predominantly cohesive failures in Groups I and III, adhesive failures in Groups II and IV, and mixed failures in Group V [Graph 2]. Cohesive failure in Groups I and III indicates that the adhesion between the restorative material and tooth is higher than the tensile strength of the cement itself. The adhesive failures in Group II were indicative of the presence of residual silicone film resulting in reduced bond strength. Adhesive failures in Group IV seemed to be due to its etching action by the removal of hydroxyapatite. Chemical ST using 10% polyacrylic acid and 37% phosphoric acid were not efficient to remove silicone residue from the dentin surface. Aboush YE. Removing saliva contamination from porcelain veneers before bonding. J Prosthet Dent 1998;80:649-53. Eiriksson SO, Pereira PN, Swift EJ Jr., Heymann HO, Sigurdsson A. Effects of saliva contamination on resin-resin bond strength. Dent Mater 2004;20:37-44. 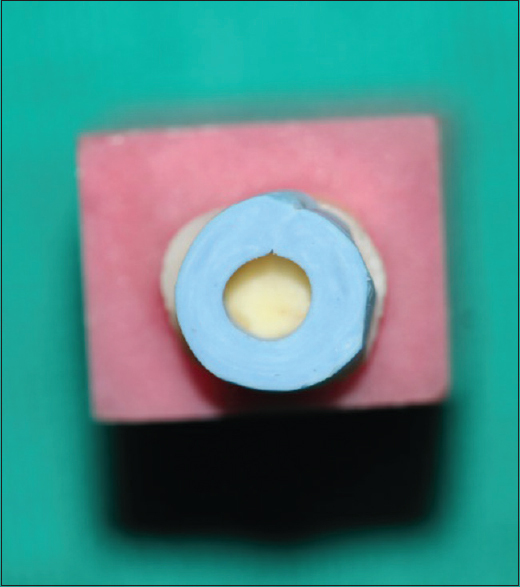 Millstein PL, Ho JC, Naim W, Nathanson D. Effect of a silicone fit-indicator on crown retention in vitro. J Prosthet Dent 1989;62:510-1. White SN, Sorensen JA, Kang SK. Improved marginal seating of cast restorations using a silicone disclosing medium. Int J Prosthodont 1991;4:323-6. Davis SH, Kelly JR, Campbell SD. 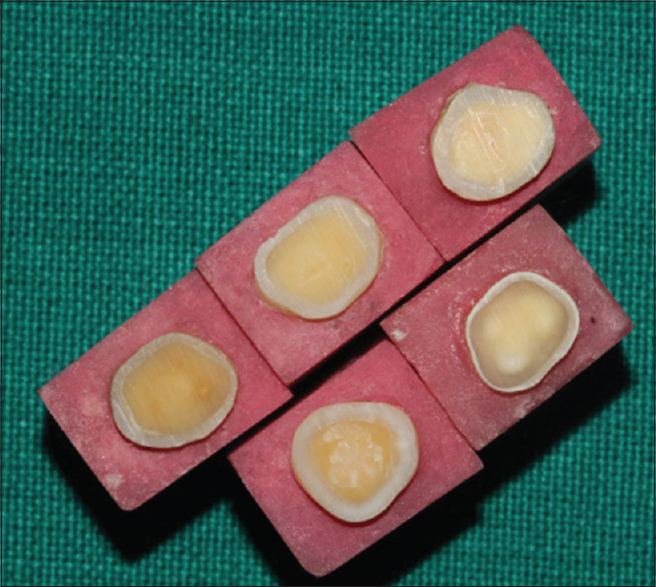 Use of an elastomeric material to improve the occlusal seat and marginal seal of cast restorations. J Prosthet Dent 1989;62:288-91. Rissin L, Wetreich G. Utilization of elastomeric materials to evaluate the accuracy of cast restorations prior to cementation. J Prosthet Dent 1983;49:585-6. 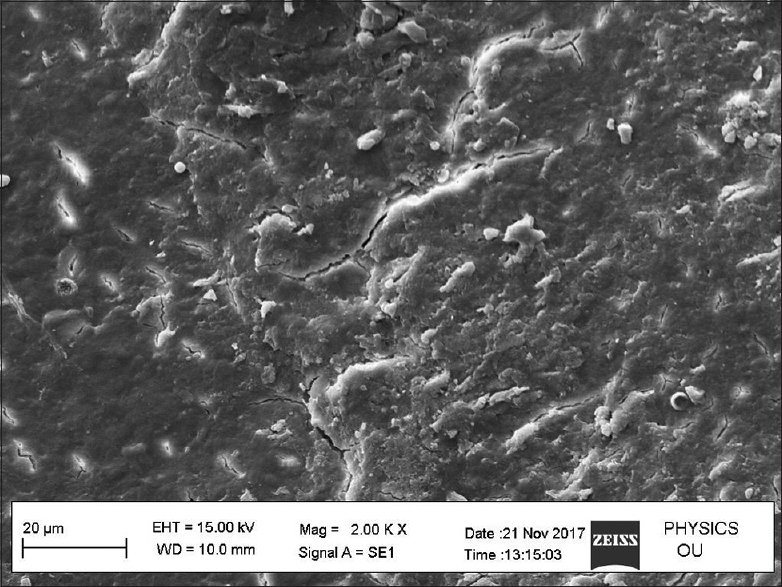 Szep S, Schmid C, Weigl P, Hahn L, Heidemann D. Effect of the silicone disclosing procedure on the shear bond strength of composite cements to ceramic restorations. J Prosthet Dent 2003;89:60-5. Sorensen JA. Improved seating of ceramic inlays with a silicone fit-checking medium. J Prosthet Dent 1991;65:646-9. Yang B, Wolfart S, Scharnberg M, Ludwig K, Adelung R, Kern M. Influence of contamination on zirconia ceramic bonding. J Dent Res 2007;86:749-53. Hammad IA, Al Amri M. The effect of two fit-indicating materials and various subsequent cleaning methods on the retention of simulated crowns. J Prosthet Dent 2008;99:46-53. Wille S, van Broeck V, Strunskus T, Faupel F, Kern M. Quantitative evaluation of contamination on dental zirconia ceramic by silicone disclosing agents after different cleaning procedures. Materials 2015;8:2650-7. Mauro SJ, Sundfeld RH, Bedran-Russo AK, Fraga Briso AL. Bond strength of resin-modified glass ionomer to dentin: The effect of dentin surface treatment. J Minim Interv Dent 2009;2:45-52. 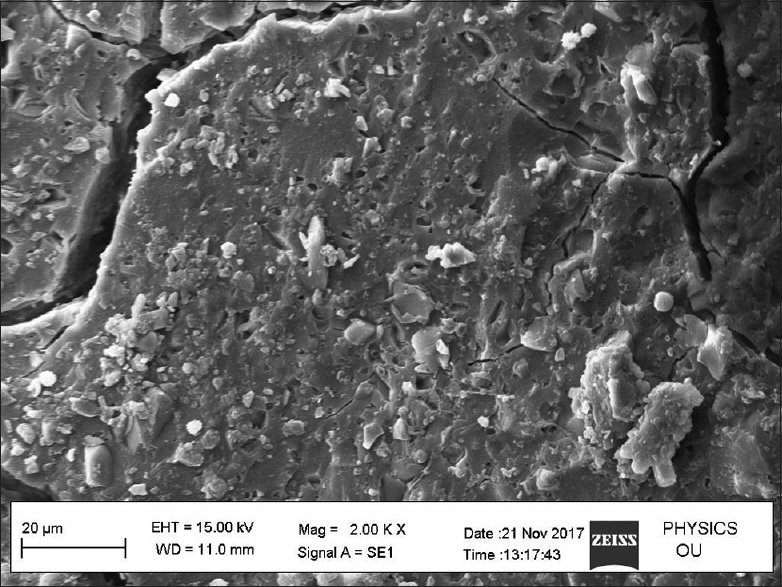 Klosa K, Wolfart S, Lehmann F, Wenz HJ, Kern M. The effect of storage conditions, contamination modes and cleaning procedures on the resin bond strength to lithium disilicate ceramic. J Adhes Dent 2009;11:127-35. Quaas AC, Yang B, Kern M. Panavia F. 2.0 bonding to contaminated zirconia ceramic after different cleaning procedures. Dent Mater 2007;23:506-12. Poggio C, Beltrami R, Scribante A, Colombo M, Lombardini M. Effects of dentin surface treatments on shear bond strength of glass-ionomer cements. Ann Stomatol (Roma) 2014;5:15-22. Duke ES, Phillips RW, Blumershine R. Effects of various agents in cleaning cut dentine. J Oral Rehabil 1985;12:295-302. Grasso CA, Caluori DM, Goldstein GR, Hittelman E.In vivo evaluation of three cleansing techniques for prepared abutment teeth. J Prosthet Dent 2002;88:437-41. Button GL, Moon PC, Barnes RF, Gunsolley JC. Effect of preparation cleaning procedures on crown retention. J Prosthet Dent 1988;59:145-8. Gateva N, Gusyiska A, Stanimirov P, Kabaktchieva R, Raichev I. Effect of etching time and acid concentration on micromorphological changes in dentin of both dentitions. J IMAB2016;22:1099-110. 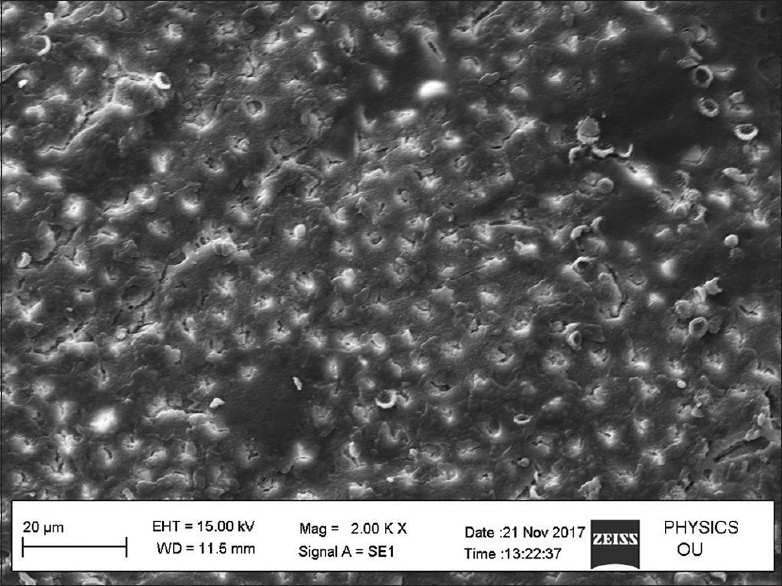 Somani R, Jaidka S, Jawa D, Mishra S. Comparative evaluation of smear layer removal by various chemomechanical caries removal agents: An in vitro SEM study. J Indian Soc Pedod Prev Dent 2015;33:204-7. Hewlett ER, Caputo AA, Wrobel DC. Glass ionomer bond strength and treatment of dentin with polyacrylic acid. J Prosthet Dent 1991;66:767-72. Tomar SS, Bhattacharyya J, Ghosh S, Goel P, Das S, Chakarvarty K, et al. Comparative evaluation of bond strength of all-metal crowns with different luting agents after undergoing various modes of surface treatments: An in vitro study. J Indian Prosthodont Soc 2015;15:318-25. Veljee TM, Shruthi CS, Poojya R. Evaluation and comparison of the effect of different surface treatment modifications on the shear bond strength of a resin cement to titanium: An in vitro study. J Indian Prosthodont Soc 2015;15:308-12.